I may have grown up in the Blue Ridge Mountains, but given the choice between traversing a snowy alpine slope or walking on a warm, sandy beach, I’ll opt for the seashells. I know how to ski, but the whole idea of leaning downhill goes against every fiber in my body. Maybe I started at too old an age – my first time on snow skis was late in high school and the blue jeans I wore ended up cold and wet after my beginner tumbles in the snow. Four years later, I tried again on an ice covered, sub-zero Vermont mountain. I emerged unscathed, but also unsold on the sport. My kids have had a completely different experience. They were on skis at an early age and their youthful fearlessness allowed them to plow downhill with joy. One year, my fun-loving son decided to ski in a banana costume and he was quickly known by folks all over the mountain. I’ve long envied their enjoyment of the sport, but the fear of being hurt in a crash hangs over my own ability to embrace it. I hated getting a call that the ski patrol was bringing my older daughter down the mountain with a serious leg injury, but I have to admit that her broken bone was as good as new in just a couple months. What must it be like for the parents of Olympic skiers? For years, they’ve watched their progeny hurtle downhill at speeds that leave little room for error. And what about the snowboarders whose tricks seem to defy death? It was certainly thrilling to watch Shaun White win gold after missing out in Sochi. What I found even more captivating was the backstory on his training in the months before he headed to PyeongChang. During a practice run in New Zealand, he crashed while trying to land a double cork 1440. Watching that video made me cringe. White’s collision with the ice led to 62 stitches, a pulmonary lung contusion and a stay in intensive care. The Olympic snowboarding events occurred in the same week as the stock market’s February tumble. That got me to thinking about risk. There has been much talk of risk in financial markets of late, though in this context “risk” is most often a synonym for short-term price volatility. Though I understand the finance industry’s definition, I think of risk as something far different – something more akin to what Shaun White faces in the halfpipe. Risk is an important component in establishing the target weight (size) for a stock in our portfolios. We generally only invest 2% of our funds in what we perceive as the riskiest equities while those deemed to have less downside could have a 4% target. In setting these targets, we rely on a range of factors that include the underlying volatility of the businesses in which we invest, their financial strength, and their perceived exposure to economic downturns. Ultimately, we invest when we see a favorable tradeoff between expected return and downside risk. Risk – How Much Does It Hurt? How Quickly Can You Recover? I remember watching ABC’s Wide World of Sports as a kid. Every week, we’d hear the announcer’s famous line: “the thrill of victory… and the agony of defeat” while watching 22-year-old Slovenian ski jumper Vinko Bogataj wipe out on the takeoff ramp – his body flying through the air before hitting the ground. It’s hard to believe that such a spectacular crash produced only a concussion and a broken ankle; he was back on the slopes three months later. Just as a couch potato avoids fractured limbs by staying in front of the television in his living room, about the only way to avoid investment injury is to keep all your money in cash. But then, you run another risk – losing purchasing power by not keeping up with inflation. So, instead of trying to avoid risk, perhaps we should ask ourselves how we can manage it. We should also try to understand if we are being well compensated for the risk we take. The most devastating of investment risks are permanent losses of capital. For example, many major financial companies like AIG, Fannie Mae and Lehman Brothers suffered debilitating injuries when the housing bubble burst in 2007. Their shareholders will never fully recover their losses due to massive dilution, government seizure and bankruptcy, respectively. You won’t find securities like the VelocityShares Daily Inverse VIX Short-term ETN in our portfolios. We keep it simple by not attempting a double cork 1440. Instead, we are selective and we invest in businesses that generate cash because we believe cash underpins value. We don’t want investments in which a change in the wind blows us off course – in winter Olympic terms, we’re the cross country or biathlon teams; we’ll leave the giant slalom and slopestyle snowboarding to others. We may not go down the mountain as fast as more daring athletes, but we know that no one makes it to the medal stand if they fail to finish the event. In certain environments, our focus on contrarian value investing can lead us to be out of sync with the broad market. This year has begun as yet another year in which investors are chasing fast growing companies and stocks with momentum. Inherently, people are investing with a belief that past performance is a predictor of future results. How will they fare, however, when the wind inevitably changes? I’ve never felt compelled to follow the herd and I see no good reason to start doing so today. We will continue to make what we believe will be market beating, long-term investments. We will focus on managing risk not with a single tool, formula or algorithm, but with methods that have served me well for years. When market participants talk of risk, they often use the term beta. A security’s beta is calculated by dividing the covariance of the security’s returns and the benchmark’s returns by the variance of the benchmark’s returns over a specified period. Basically, a stock’s beta is supposed to represent how that stock will perform relative to the market. For example, a stock with a beta of 1.20 is deemed to magnify a move in market by 20% – if the stock market falls 10%, then that stock should theoretically go down 20% more. This makes risk management look easy – if you are worried that the stock market is going to fall, you should sell the high beta stocks (over 1.00) in your portfolio and replace them with low beta stocks and cash. There are problems inherent to this approach – first, trying to time the market is notoriously difficult; second, beta is a measure of correlation with the market and may not capture company specific volatility – what some would call idiosyncratic risk; third, beta calculations change over time and these backward-looking measures can be misleading. For example, the graph below plots the beta of IBM over the last decade. Back in 2007, IBM sported a beta well in excess of 1.00 – if you could have correctly predicted that the stock market was headed for a crash and you relied on beta for risk management, you would have wanted to eliminate a stock like this from your portfolio. 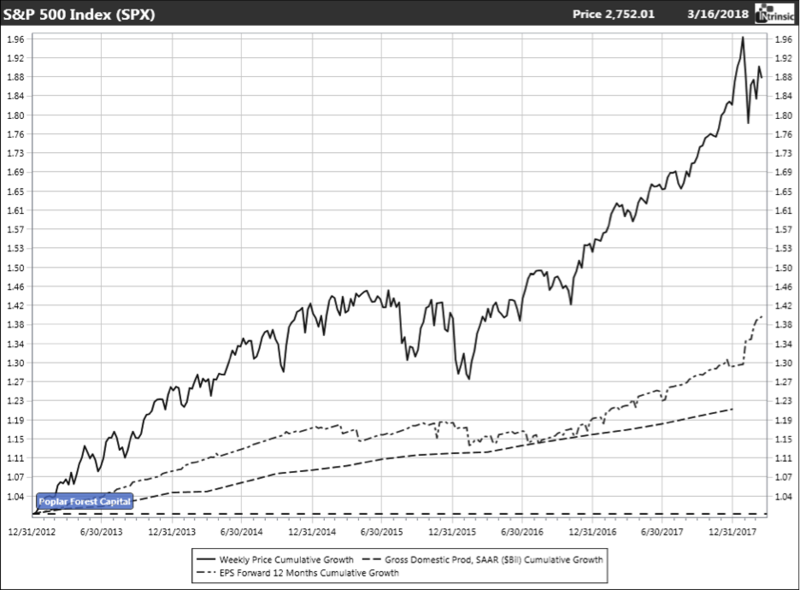 Between 12/31/06 to 12/31/08, the S&P 500 fell 34% (from 1418 to 903). At the end of 2006, IBM’s beta of 1.8x suggested a forecast 61% decline in a period when the S&P dropped 34%. And yet, IBM’s shares fell just 13% (from $97.15 to $84.16). On a relative basis, using beta to manage risk would have been quite costly in this instance. One of my biggest quarrels with beta is that it is price independent – I think price matters. 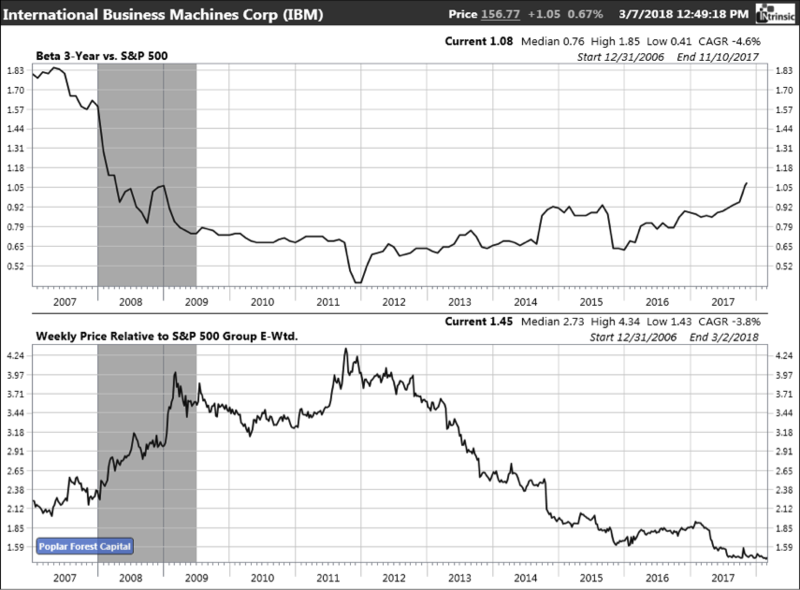 As you can see on the graph, IBM’s calculated beta was at a decade low (suggesting less risk) in 2011 just as its stock price was making a high relative to the S&P 500. In the same way that beta gave a misleading reading of IBM’s risk in 2006, it did so again five years later. Given its limitations, we don’t use beta as a tool in determining the appropriate weighting for a stock in our portfolio. And while we do consider stocks’ volatility when assembling our portfolios, we believe it is a far from complete risk management tool. Frankly, the volatility of a company’s stock price is much less important to me than is the underlying volatility of a company’s financial results over an economic cycle. Financial and operating leverage is great when times are good. Anyone who has borrowed money to buy a house knows that a mortgage makes possible a purchase that likely wouldn’t be possible if you had to pay 100% cash. With home prices generally increasing over time, the equity in one’s abode can grow much faster than the value of the place. For example, a $1 million home would be worth more than $1.34 million in ten years if prices were to increase by 3% a year. A $900,000 mortgage to buy the house would require $100,000 in initial equity and ten years later, that equity would be worth $440,000 even if no principal were repaid along the way. That simple math suggests that a homeowner’s equity could grow 16% a year despite the home price only increasing 3% a year – ah, the joys of leverage! Unfortunately, it works both ways, as we saw when the housing bubble burst in 2007-08 and many people had their home equity wiped out when prices fell. In some cases, it has taken ten years for people to get back to breakeven. It’s the same way with companies. When times are good, leverage magnifies results. For example, in the five years ending 12/31/17, the U.S. economy grew at a rate of 4% a year. Due to financial and operating leverage, the companies in the S&P 500 have been able to grow their earnings at a rate of 5% a year during this same time period and stock prices have compounded at an even faster 13% rate. When the next recession hits – perhaps several years from now, perhaps sooner – that leverage will work in reverse. As a result, I have long considered the amount of leverage used by companies to be a key risk indicator. 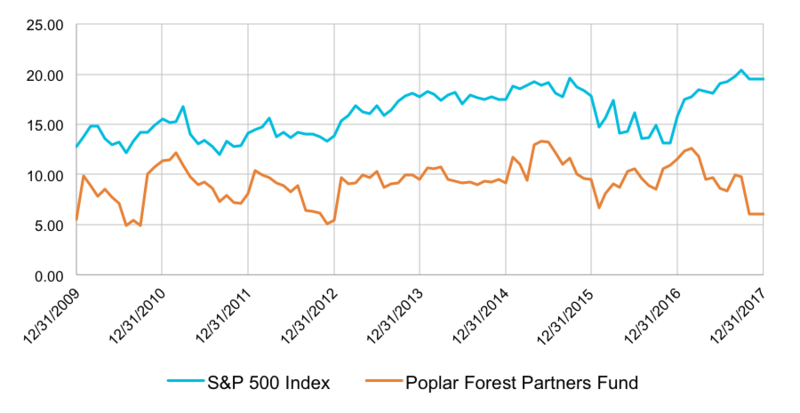 In the same way a bank uses a consumer’s credit score to determine whether and how much credit to extend, at Poplar Forest, we use companies’ credit ratings as a risk management tool. We like credit ratings because they take into account a range of quantitative and qualitative measures in assessing a company’s ability to repay its debt including, but not limited to, simple measures of financial leverage. At Poplar Forest, we don’t just focus on how much money we can make if things go our way; we also spend a lot of time analyzing the downside if we are wrong. Try as we might to avoid them, we sometimes make incorrect investment decisions. Sometimes we miss-assess a specific company’s fundamentals, but other times the problem may be macroeconomic. For example, few people correctly predicted the bursting of the housing bubble and the recession it created in 2007-08. Having a sense of how bad things could get would have been helpful to investors in financial services companies in 2007. Many of those companies had done incredibly well for years as they slowly increased leverage and reported year after year of wonderful earnings growth. Alas, when the Great Recession hit, the downside was tremendous – in several cases, companies that had appeared to be solid and successful ultimately went bankrupt. Credit ratings and correlation measures like beta under-represented the risk in these businesses. As an alternative to simply relying on backward-looking quantitative data, we use forward-looking fundamental analysis to assess the downside a stock may suffer if the U.S. fell into a recession. This is inherently a more subjective approach as it requires assumptions of the impact of a recession on an individual business, but we believe that understanding what can go wrong and the magnitude of potential decline is an important risk management tool. Particularly now, after nine years of economic growth and at a time when the general macroeconomic outlook looks rosy, we have increased the weight of our recessionary downside calculations in managing risk in the portfolio. We understand that our downside calculations will not be precisely right, but we believe that being approximately right in terms of direction and order of magnitude will be a great help in managing our portfolios. I have long believed that the price paid for a security has a tremendous impact on the risk of the investment. At a low price relative to underlying value, it seems fair to believe that there is less downside risk than there would be in paying a high price. 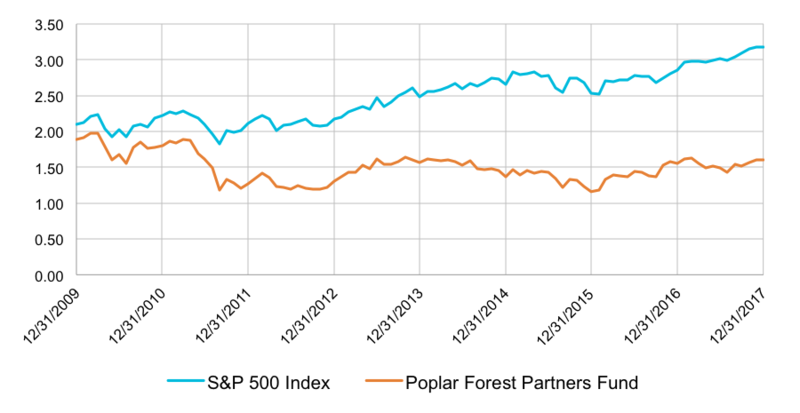 Our analysis of investments is anchored to a comparison of price to normalized free cash flow and sustainable growth. In simple terms, we solve for a value that we believe would provide us at least a 15% total annual return for three years and 9-10% a year in the long run (beyond year three). For example, if we believed that a company was capable of growing 5% a year for 10 to 20 years, we would peg its long-term fair valuation at the equivalent of a 4-5% free cash flow yield. In effect, if you give me 5% every year and those payments grow 5% a year, then I should expect a 10% total return in the long run. We only purchase stocks when we see a unique opportunity to buy at a discount – to invest in businesses that we’d be comfortable owning for a decade or more when their stock price has fallen to a level that we believe puts us in a position to potentially make at least a 15% a year total return for three years. I have used absolute return framework for more than 20 years and I have found it to be helpful in mitigating risk. This framework helps keep my feet on the ground when other investors grow overly enthusiastic (as in 1998-99) and it also underpins my courage when others are excessively fearful (like 2008-09). We recently completed an analysis of the valuation metrics of our portfolio over the last decade. What we found wasn’t surprising. The valuation of our portfolios relative to measures of fundamental value – financial measures like book value and cash flow – has stayed relatively constant while these same measures for the S&P 500 have increased. The message from this analysis is that we’ve stayed with our framework despite the stock market growing increasingly expensive and, as a result, our portfolios appear to provide less downside risk than the broad market as we have a much firmer value underpinning. Information technology has been a great help to productivity over many decades and the tools available to us today are certainly an improvement over what was available when I first got into the business. That said, sometimes good ideas can get taken to an extreme that become problematic. In the current environment, there seems to be a belief that fancy mathematical formulas and algorithms can produce better investment results than the hard work and judgement of experienced financial analysts. This technological arrogance will, in my opinion, ultimately be the downfall of the current wave of machine intelligence being deployed in markets. I believe the inherent flaw is the backward-looking development of these tools. Their promoters provide beautiful reports that demonstrate the back-tested results that support their claims often without acknowledging that these models are all fundamentally anchored in extrapolating current trends into the future. In the 37 years since I bought my first stocks, I’ve seen purportedly foolproof systems fail to deliver – from the disastrous results of “portfolio insurance” in 1987, to the collapse of Long-Term Capital Management in 1998, to the implosion of collateralized debt in 2008 to the decimation of VelocityShares Daily Inverse VIX Short-term ETN in February of this year. All these products looked great on paper and they produced wonderful returns in the years leading up to their collapse. Like leverage, momentum can be your friend until it suddenly evaporates and investors may be left to try to salvage just pennies on the dollars they had invested. In many cases, these speculative securities were not underpinned by anything that can be touched – there was no underlying cash flow to lean on when times got tough. In contrast, we believe that free cash flow is critical to investment success. In my experience, changes in trends are as inevitable as falling on a ski slope. To invest in a manner that doesn’t acknowledge and buffer against such potentialities seems foolhardy and inherently risky, regardless of what the beautiful back-tested model shows. Inherently, investing is difficult because the future is impossible to predict with any certainty. All we know for sure is that life is cyclical – goods times will ultimately yield to recession, and recession will ultimately lead to recovery. That said, each recession is different than the last. For example, bank stocks did well when the tech bubble burst in 2000-02, but they were at the heart of the market crash when home prices collapsed in 2007-09. At Poplar Forest, we keep a close eye on the environment as we look for signs of trouble. At the same time, we understand that each recession and each bear market have its own unique characteristics. We believe that extrapolating what worked best last time will likely lead to disappointing results. While we are sensitive to risk of loss, we are not arrogant enough to believe that we have some special forecasting skill that will allow us to predict the next recession any better than other serious investment professionals. What we can do is focus, from the bottom up, on the companies in which we are invested and those we consider for potential investment. We want to understand the volatility of each underlying business, how much leverage is being deployed, the downside in a recession and the price we are paying relative to the underlying value of the company. We invest in companies for the long run when we see a favorable tradeoff between these risks and expected returns in a normal/mid-cycle time frame. We think a recession is likely sometime in the next few years and we want to be comfortable that we will survive a spill in the financial halfpipe without a trip to the intensive care unit. We believe that judgement, hard work and discipline are keys to our investment survival. Shaun White has not only survived, he has prospered with halfpipe gold medals in 2006 (Turin), 2010 (Vancouver) and 2018 (PyeongChang). But he completely missed the medal stand in 2014 (Sochi). 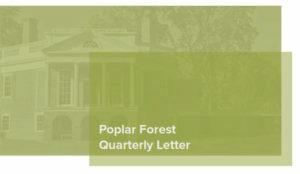 Like White, our investment process doesn’t produce a gold medal every year, but the investing framework we use at Poplar Forest has served me well for over 20 years and I believe that it will continue to do so in future decades. As we have since our founding days, we will invest your money the same way we invest our own, and I look forward to reporting on our shared success in the years to come. P.S. With this letter, we are moving to a new reporting cycle that we hope you find helpful. We plan to distribute my Quarterly Commentary as soon as possible after the end of each quarter. That will be followed, perhaps a week later, with a more detailed report on the investment results of our funds. Please don’t hesitate to let us know what you think of this new approach.